It all starts with the sled. 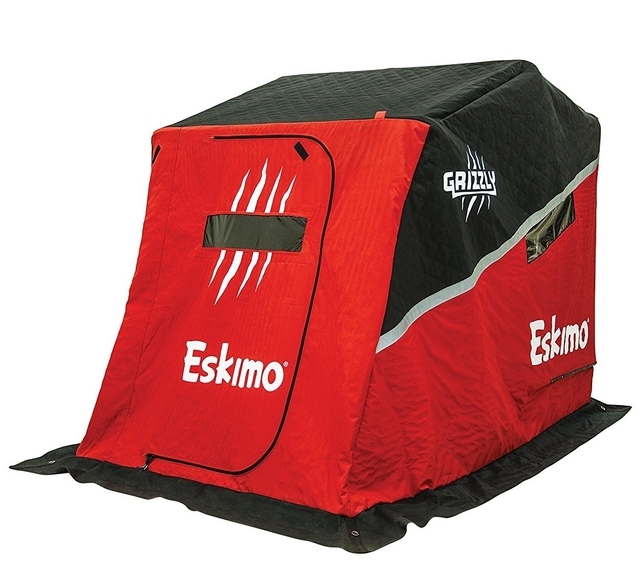 Our all-new Grizzly flip shelter packs into the toughest tub on the market. This ultra-sturdy, 70" roto-molded sled can take any abuse you throw at it and features slots that accept 2x4s for easy gear organization. Deeper runners help the Grizzly track straighter and slide across the ice with less effort. A brand new, fully-adjustable Versa seating system sits on top of the sled. Both seats swivel, slide front-to-back, side-to-side, and also lift up for quick access underneath. All-new square aluminum tubing creates the sturdy framework, and is wrapped by our new 900D four-layer Storm Shield insulated fabric. Storm Shield traps in the heat, keeps out the elements and minimizes condensation. • Roto-molded, 70 inch Sled. Built to withstand bumps, scrapes and drops without breaking or wearing out. • Storm Shield fabric. 900D, four-layer, insulated fabric traps in the heat, keeps out the elements and minimizes condensation. • Sliding versa seating System. • Interior windows feature hook and loop fastener tape along the top and zippers on each side.